While Jennifer Aniston is the official cover star for the mag, Christy Turlington & Rachel Brosnahan are the September 2018 subscriber cover of InStyle magazine. 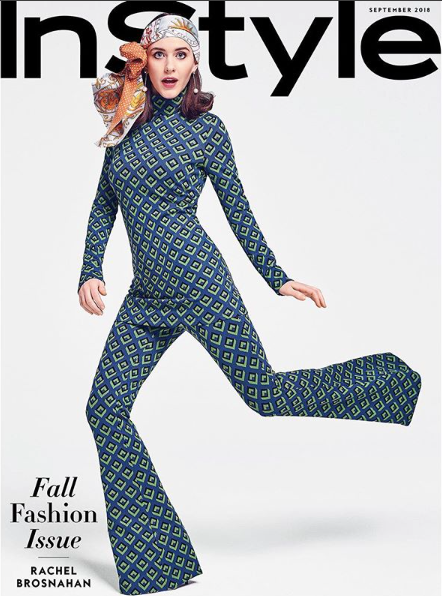 On Christy's cover which was shot by Chris Colls, she is wearing VERSACE FALL 2018 and on Rachel's cover which was shot by Tom Allen, she is DIANE VON FURSTENBERG FALL 2018. Continue below to see Christy & Rachel's individual covers and to read excerpts from their interview. For more on Christy's feature, click HERE and Rachel, click HERE. A lot of those things are just coming into her awareness now. She’ll probably have more questions. Even people she’s met through me, she mostly doesn’t even know who they are or what their significance is. I remember when my niece, who is 21, transcribed something for me, and Basquiat came up. She didn’t know how to spell it, didn’t know who he was, and then a year later was like, ‘Oh my god. There will be no party. I’m not a party person. I just want my family around. It’s the day after New Year’s, so to me it’s a perfect time to reset. The only thing I don’t like about this birthday is I like odd numbers better. I don’t know why. I think of my 49th birthday as my 50th birthday. So in my mind it’s already kinda happened. Diane von Furstenberg Fall 2018, David Yurman jewelry and a Hermes scarf. In the past they’ve said ‘Brushnananhan,’ ‘Brushnahan,’ ‘Branininin.’ Or, you know, just ‘Bleh,’ So now strangers can say my last name. That’s probably the most improbable thing that’s happened since I won. She’s trying to have it all. And sometimes those things complement each other, and sometimes they’re completely at odds with each other. In the second season we’ll explore the ripple effect of that as well.